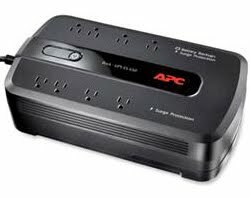 A Battery Backup UPS seamlessly switches to battery power during a power outage or spike, allowing your computer and other electronic devices to continue working while protecting them from damage. Have you ever lost your hard work after a power outage or power spike shut off your computer? Put an end to this issue with a Battery Backup / Uninterruptable Power Supply (UPS). These inexpensive power devices not only protect your computer from power outages, spikes and drops; they also store battery power to keep your system running until the power comes back on. There are many UPS models to choose from with varying battery run-times and AC plug-in receptacles to meet your specific needs. Most come with at least 3 Surge-Only plugs and 3 Surge + Battery Backup plugs and enough power to run for a few minutes time. The Surge + Battery Backup plugs allow for protecting and powering your computer and monitor during a power spike/outage, while the Surge-Only plugs protect devices like printers, phones and calculators that are not critically necessary for computer use. UPS units are rated by Volt-Amps (VA) and Watts (W). A 350VA to 500VA UPS will protect the average laptop or desktop computer for a couple of minutes, while more powerful computers/devices require a higher VA rated unit, such as a 750VA model. The Watts rating varies between models. Check the Run-Time ratings on each product to meet your needs. Run-Times are shown in Full-load or half-load ratings (in minutes) indicating the duration of time the UPS will power devices when they are drawing the maximum or half of the maximum wattage capacity. Many UPS devices come with a free Auto-Shutdown software that can properly save your work and shut down your computer when the battery power is critically low. UPS Battery Backups are universal power units and will power/protect any electrical device as long as it's power draw (in watts) is within the unit's capacity. Check the Watts rating for the device before connecting to the UPS to see if it surpasses the unit Watts rating. When in doubt, plug the device into the UPS's Surge+Battery plug, then unplug the UPS from the wall outlet (with both UPS and device powered on). See how long, if at all, the device stays on under battery power. Don't wait until you lose work or damage electronics due to power spikes or outages. Invest in a UPS Battery Backup device to protect your valuable computer equipment and files from damage or loss. The next time a power spike hits your office or home, you'll continue computing with a smile. Shop for Battery Backup / Uninterruptable Power Supplies (UPS) at http://www.theupgradeplace.com/ to take advantage of discount prices. Choose from trusted brands including APC, TrippLite and more.